Young Gen Ys watched more than twice as much online video as the general video watching population in September, a staggering 11 hours for the month. Nielsen’s Online Ratings ‘Video Census’ tool found the divide between young Gen Ys (18 to 24 year olds) and older Gen Ys (25 to 34 year olds) – a phenomenon which sees markedly different web use habits between the two sub-segments – was also carried out in online video viewing behaviour. Young Gen Ys watch on average 243 videos per month, while they’re older counterparts watch significantly less (168) and spend almost four hours less watching video content. Both however come in above the average population figure. In September, more than three‐quarters of online Aussies (11.7 million people) watched web-based video content, spending an average of around five hours watching 127 clips. 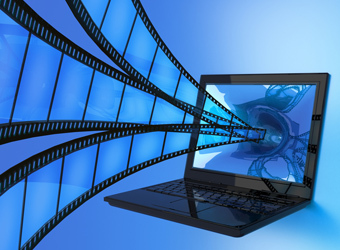 The trend towards lower online video consumption as age increases was held out across the generations, with Gen X watching 110 clips per month – nearly five hours – and Baby Boomers watching 62 – around two and a half hours. However, as managing director of media at Nielsen, Matt Bruce, points out, while the over 55s spent the least amount of time viewing, they made up the biggest audience segment at 3.64 million. View: Marketing‘s online video infographic, which suggests sport may not be the only reason males watch more video. 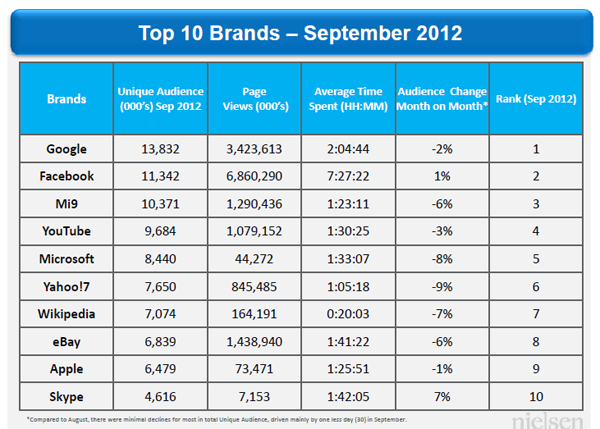 Little change was recorded in the most visited websites for September, with Google maintaining its place as the most visited, closely followed by Facebook, which continues to dominate for time on site. The escalating use of mobile usage continued in September with mobile page views increasing to more than 308 million, an increase of 3% from August 2012 and 196% since October 2011.